Consumers expect an exceptional experience with your company, and unfortunately, people talk about bad customer experiences more than they’ll brag about good ones. Research found that 86 percent of buyers will pay more for a better brand experience, but only 1 percent feel that vendors consistently meet expectations. Customer satisfaction (CSAT) surveys are used to understand your customer’s satisfaction levels with your organization’s products, services, or experiences. 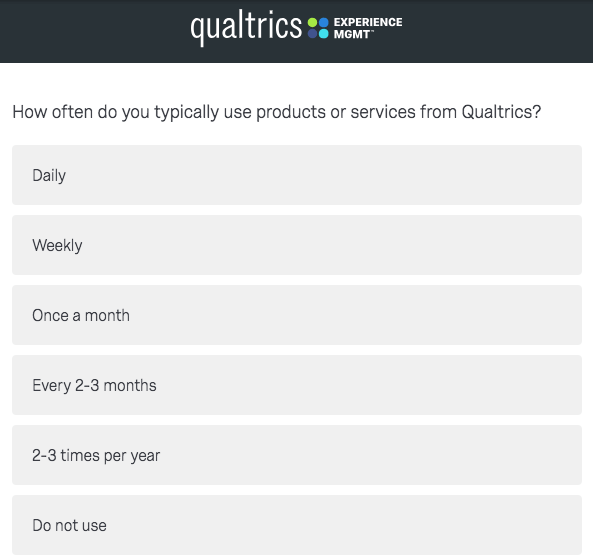 This is one type of customer experience survey and can be used to gauge customers needs, understand problems with your products and/or services, or segment customers by their score. They often use rating scales to measure changes over time, and gain a deeper understanding of whether or not you’re meeting the customer’s expectations. Customer satisfaction is at the core of human experience, reflecting our liking of a company’s business activities. Americans will mention a positive experience to an average of nine people and a negative experience to an average of 16. High levels of customer satisfaction (with pleasurable experiences) are strong predictors of customer and client retention, loyalty, and product repurchase. Data that answers why a customer or client enjoyed their experience helps the company recreate these experiences in the future. Effective businesses focus on creating and reinforcing pleasurable experiences so that they might retain existing customers and add new customers. In this article we will be focusing on customer satisfaction (CSAT) surveys. Ask for overall company rating first– This satisfaction survey question gives you great initial insight and allows you to compare to industry and internal benchmarks over time. Allow for open text feedback– Open text questions allow you to collect open-ended responses from your respondents. You can gain more detail about your customer’s experiences and you might uncover new insights you didn’t expect. Optimize for mobile– Many consumers are now completing surveys on mobile devices or within mobile apps, so your survey must be optimized for mobile devices. If it is too complicated for a mobile respondent, survey participation will decrease. Ask double-barrel questions– These questions touch on more than one issue, but only allow for one response. They are confusing for the respondent and you’ll get skewed data because you don’t know which question the respondent is answering. Make the survey too long– The majority of CSAT surveys should be less than 10 questions. People won’t finish long surveys. Use internal or industry jargon- Your customers must be able to clearly understand each question without hesitation and using internal or industry jargon is confusing to respondents. Proper timing of customer satisfaction surveys depends on the type of product or service provided, the type and number of customers served, the longevity and frequency of customer/supplier interactions, and the intended use of the results. Nevertheless, timing surveys is extremely important. The experience should be fresh in your respondent’s mind so you get the most honest answers. You can solicit feedback face-to-face when they leave your store, email, online survey, phone, or within your mobile app. For example, let’s look at the airline industry. Customer satisfaction surveys can be sent at every touchpoint in the process. After the customer books their flight– Feedback after the initial purchase is important because you want to understand if the person was satisfied with their checkout or purchase experience. Send an email with a link to an online survey after the customer purchases their flight to find out how satisfied they were with the booking process. Consumers want easy transactions, so look for ease-of-use in your data. After the actual flight– Post-purchase evaluations reflect the satisfaction of the individual customer at the time of product or service delivery (or shortly thereafter). This can be a transactional NPS or CSAT survey and sent by email. After a customer service encounter- If the customer initiates contact with customer service, a CES survey should be sent immediately after the issue was resolved. For airlines, this could be a call to change a flight date or report lost baggage. The goal is to see how much effort it took to resolve the issue. Six months after the flight– To measure the long-term customer loyalty, relational NPS or CSAT surveys can be sent months after the transaction occurred to see if your customers are still loyal to your brand. In-app mobile feedback– You can request customer feedback on the mobile app or customer experience through a feedback tab in the app. Getting mobile app feedback is important only your customers can tell you what will make them more satisfied with their experience. Adding additional questions can help you sort through and take action on your customer feedback, just remember that shorter is generally better when it comes to survey completion rate. Edit the usage frequency options below so that they are relevant to your industry or product. This helps you understand the users skill level with your product/service. Demographic questions can be helpful in understanding what audiences or customer segments you are excelling with or under serving. 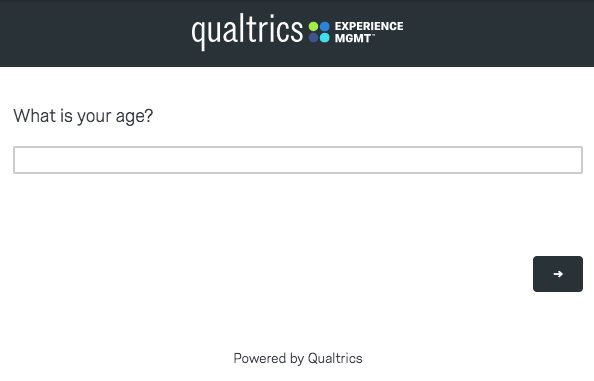 Qualtrics recommends getting as much of this data from your customer database or CRM as opposed to asking for it in a survey whenever possible. Below are some potential demographic question you can add to your survey. This helps you identify satisfaction drivers highlighting the areas of a customers experience that are important, allowing you to align product and service priorities around that. Below are potential categories of drivers. This question allows customers to provide unsolicited open-text feedback and mention specific topics or experiences for your team to review. This is a simple question asking if its okay if a rep reaches out to the respondent to try and understand and resolve any pain points. Measuring customer satisfaction is important but what you do with the data is essential. If your customers take the time to fill out a survey, it’s important they know you’re serious about more their experience better. Close the loop– Respond quickly after receiving negative feedback from your customers. This is a chance to keep your customer loyal. 70 percent of consumers said they would be more likely to do business with an organization again if their complaint was handled well the first time. Analyze for trends– Understand what metrics you’re looking to improve and see if there are patterns on these specific items. For instance, if 30 percent of respondents say the customer service wait time was too long, you know you need to improve in that area. Do you want to go deeper into customer insights and create loyal and satisfied customers? Here is a prebuilt customer satisfaction survey template you can use in your customer experience management (CXM) to start properly measuring customer satisfaction. 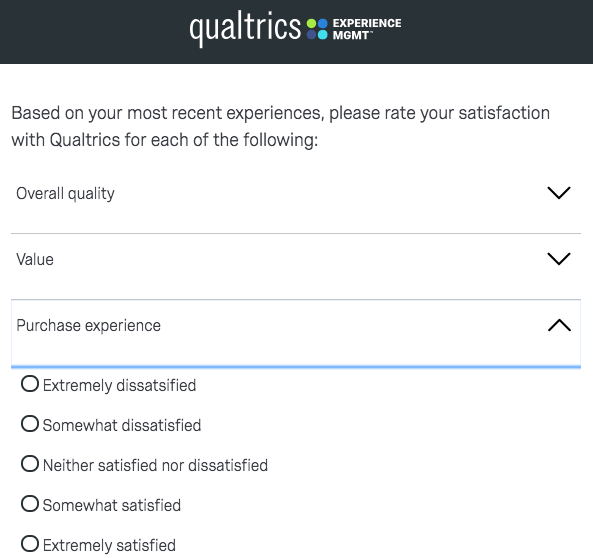 Keep in mind, all of these customer satisfaction surveys can be used today when you sign up for a FREE Qualtrics account.